PAMP Fortuna 1 Ounce Rhodium bullion bars. 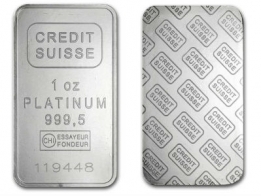 Each bar contains 1 ounce of 99.9% pure investment grade Rhodium bullion. This Rhodium bar is the first of its kind to be readily available to investors on the precious metals market. It was introduced into the market by PAMP in 2016. Rhodium is a rare metal, significantly less common than platinum or palladium. It has a lot of industrial applications, and its price can vary significantly with market conditions. 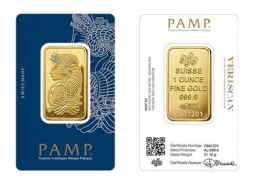 PAMP produce the Rhodium bar in the 1 ounce size only. 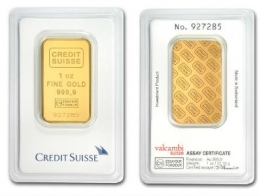 Each bar is individually registered and sealed in a protective holder, along with a signed official "Assay Certificate," which guarantees the purity, weight, and rhodium content of each product. The front of the bar features an image of Lady Fortuna. The reverse contains the name, weight, fineness and serial number of the bar. The assay certificate also confirms the authenticity and serial number of the bar. 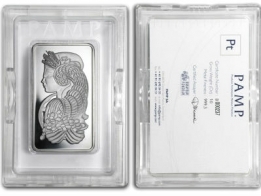 PAMP is one of the only precious metals refineries to sell a 1 Ounce Rhodium bar. Rhodium has only recently entered the precious metals market as a platinum group metal that can be invested in as a physical bar.